The first Douglas D.C.3 flew in 1935. Since that time it has been used by almost every Air Force in the World, as well as the majority of Civil Air Lines. 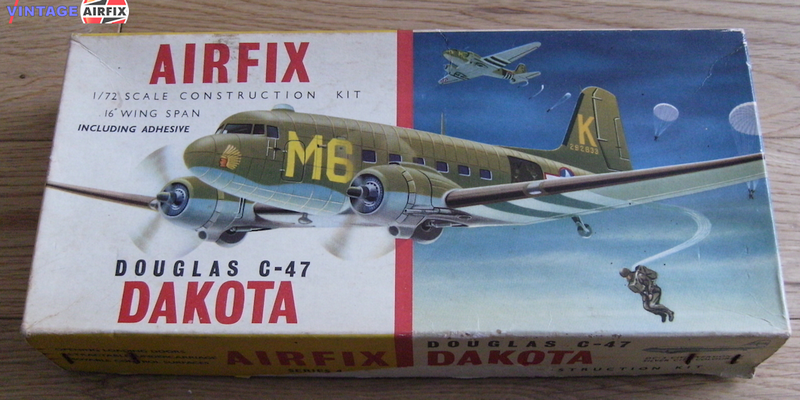 This Airfix kit contains 68 parts and builds into a magnificent model with a wing span of 15 1/2 inches. The tranfers supplied enable it to be finished either as a Silver City Airways Transport or as a C-47 of the United States Army Air Force, Here is another opportunity for the keen modeller to produce this plane in dozens of different military and commercial finishes. Known throughout the world as the D.C.3 the name Dakota was given only to the 1,895 aircraft of this type which were supplied to the R.A.F. In the American Air Force it is known as the C-47.